Please note that we've updated this blog post! Please see the current versions: "The Importance of Risk Mapping" and "How to Build a Risk Map". A risk map prioritizes a particular identified risk according to its significance and likelihood and further goes on to sort the risk into four distinct quadrants. The purpose of a risk map is to identify, quantize and qualify a group of business risks which could impact a company’s ability to accomplish its business strategies. Obviously a risk map is complex business and you need to know how to go about it. The implementation of an efficient risk map basically consists of two primary tasks. As you probably already know, a different risk map should be drawn for each distinct risk. A risk map follows a one-to-one function. For each risk, the significance is plotted on the vertical axis while the likelihood of the risk is put on the horizontal axis. Once the top risks are plotted, you need to look at the quadrants where the risks are located. The position of the risks in the quadrants gives a measure of the degree of severity of the risks and helps you prioritize them in order for you to accomplish your business strategies. A Risk Map arranges the vulnerabilities of your business risk in four distinct quadrants. The risks sorted in quadrant one of a risk map are called the Primary Risks of your business. A risk located in the first quadrant of a risk map is a critical risk that quite blatantly threatens the achievement of your company's objectives and should be reduced or eliminated with preventative controls. A risk map is perhaps the most accurate tool for you to identify those risks in your business that should absolutely be subject to control evaluation and testing at the very outset of the business. 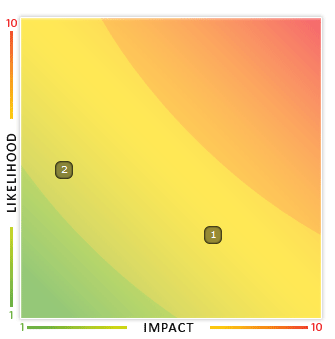 The risks in quadrant two of your risk map are the “Detect and Monitor” risks. These risks are significant but the probability of them occurring is rather low. A risk map allows you to ensure that the risks falling in quadrant two of your risk map remain at a rather low value likelihood and are managed by the company appropriately. These risks only need to be monitored on a rotational basis so you need not give them much priority. Risks in the third quadrant of a risk map are not very significant but highly likely. These risks should only be monitored once in a while. If you think about it, a risk map allows you greater efficiency where risk management is concerned. It is only too easy to become warped by unnecessary risks while the pressing ones escape you. You need to play wise with a good risk map. Low Control risks are those risks that get sorted in the fourth quadrant of a risk map. Risks in this section of a risk map are both insignificant and unlikely. However no risk should be completely ignored. You can never know when a minor issue becomes an emergency. Unless subsequent risk assessments show a substantial change, a risk map allows you to identify those risks that need minimal attention. A completed risk map should give you a reliable basis for risk assessment and the investigation of each of the identified risks. Undoubtedly a risk map is a very powerful risk tool you should not neglect. ClearRisk Manager is a risk-mapping tool that offers expertise and allows you to quickly build maps within the software. It also has an extensive risk library that offers insight on risks you may not have considered and how to implement mitigation and prevention strategies. Want more information?